After a long struggle, my computer finally died. It had been “sick” for awhile. It had slowed down, using 100% of its capacity even when there was nothing running. Charging it up had become an issue. I often had to tape the cord in place or set it just so. In the past few months, the battery had grown weaker, lasting as little as half an hour and times and passing out without warning. At the end, it kept popping and shutting off. 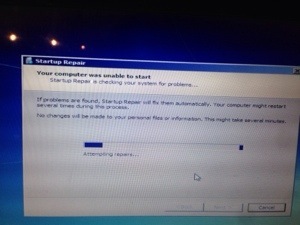 When I could get it started, windows couldn’t start up correctly. The cord began smelling like burning electrical, alerting me to the fact that I should probably stop trying. I will attempt one final recitation tomorrow, if I can get what I need from the store. (Mostly a tiny screwdriver. I already bought the krazy glue). Work is going well this moth. Exhausting, and the place is managed terribly, but just maybe I’ll be able to get a new computer soonish. Til then, I’ve got my phone. Gah! Why are the computers dying for all of my favorite blogs? Its a conspiracy I tell ya!